When you hear the name Elmore Leonard you might think of the current hit television show “Justified” which is based on a character he created for a couple of novels. Some of you will know him from “Get Shorty” and “Be Cool” as he wrote the novels those highly popular movies were based on. But way before then Elmore Leonard really bounced into popularity during the 70’s and 80’s with a bunch of very successful crime novels. His novel “Rum Punch” was filmed as one of my favorite movies of all time: “Jackie Brown” starring Pam Grier and directed by Quentin Tarantino. But even more way before then Elmore Leonard got his start back in the 1950’s writing western novels. 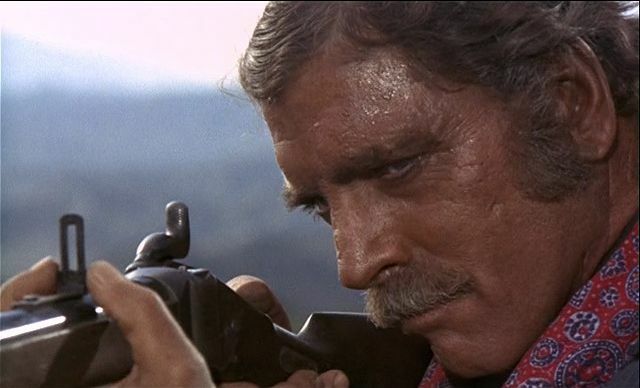 Plenty of Mr. Leonard’s westerns have been adapted into some classic movies: “Joe Kidd”“3:10 To Yuma””Hombre””Last Stand At Saber River” But my favorite Elmore Leonard western film stars one of my all time favorite actors: Burt Lancaster in VALDEZ IS COMING. Bob Valdez (Burt Lancaster) is a Mexican-American sheriff who works the Mexican half of a small town on the Texas/Mexico border. The Anglo sheriff is away on other business and so Valdez is called in to resolve a dangerous situation. A black man living with a Mexican woman has been accused of murder by the powerful gunrunner/rancher Frank Tanner (Jon Cypher). Valdez hopes to negotiate a peaceful settlement to the standoff. The shack the suspect is holed up in is surrounded by the bigoted white posse who are using the shack for target practice when Valdez arrives to do his job. Due to a series of shockingly idiotic misunderstandings Valdez is forced to kill the black man, who turns out to be innocent of the crime. What makes VALDEZ IS COMING such an interesting western is the racial bigotry theme behind the story. Blacks and Mexicans are the victims here and Valdez is motivated not so much by personal revenge as you might think. Although being tied to a cross and being forced to walk through the desert would be more than enough to piss me off, lemme tell you. But Valdez’s motivations are deeper than revenge. His personal code of justice is outraged. And he has an overwhelming desire to see that to see men act like men, own up to their mistake, do the right thing and acknowledge the innocent black man and the Mexican woman as human beings. Or at least as much as can be expected in the Old West where life was cheap and the life of minorities was even cheaper. What makes it even more interesting is that the posse Tanner puts together to hunt Valdez is primarily made up of Mexicans. Tanner’s own right hand man, El Segundo (Barton Heyman) is a Mexican and a pretty damn dangerous man in his own right who understands what Valdez is trying to do and tries to make his boss understand as well to no avail. The performances in this are really good. 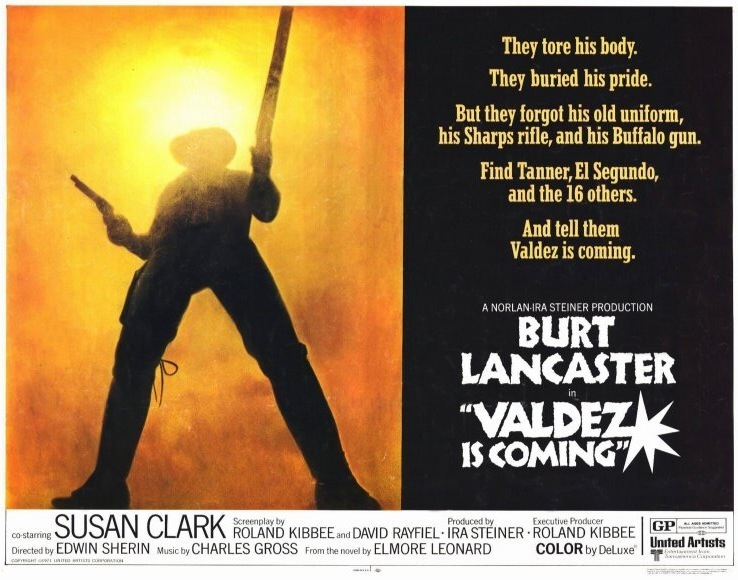 Burt Lancaster plays Valdez with a dangerous understatement that fits the character well. He goes through the first half of the movie as a shambling, quietly spoken man who has put his wild life and lethal skills behind him and is just trying to do a difficult job the best way he can. But when they rouse this sleeping giant, oh baby, does he get payback in a big way. Richard Jordan has a good role as a hired gun who oddly enough is conflicted about the way he feels about Valdez and has to put his feelings about Valdez as a Mexican and as a man in a whole new perspective as the hunt for Valdez becomes increasingly more deadly. Susan Clark is really good in this movie. Most of you reading this will probably remember her from the TV show “Webster” and I was surprised at how effective she is as Tanner’s woman. There’s an interesting subplot with her character as it’s taken as a given by the townspeople that Tanner killed her husband so that he could shack up with her. Valdez takes her hostage to try and bargain with her life for the $100 and through their time together the truth about that situation is resolved in a surprising way I really didn’t see coming. Frank Silvera plays Valdez’s best friend and they have a really good scene that says everything that needs to be said about how whites view Mexicans that resonated for me given the current climate in the Unites States about Mexican immigrants and makes you think that maybe this country really hasn’t come so far in our racial views as we like to think. So should you see VALDEZ IS COMING? I think you’d enjoy it a whole lot if you’re a western fan like I am. While it’s not as action packed or as purely entertaining as some of the other westerns Burt Lancaster has made such as “The Scalphunters” “Vera Cruz” or “The Professionals” it is a satisfying horse opera in terms of performances and story. And, yes, it’s not PC to have an Irishman playing a Mexican but that’s how things were done back then so if you want to see the movie, make your peace with that. There’s a whole lot more to VALDEZ IS COMING than the good guy simply blowing away the bad guys which is underlined by the ending which is one of the most unusual of any western I know but it so absolutely right that I can’t imagine any other way the movie can have ended. If your cable/satellite provider carries Turner Classic Movies you can wait for VALDEZ IS COMING to show up there as it seems to be a favorite there of somebody in Programming as they usually run it on a Saturday afternoon and if you’re lucky you’ll find it paired with “The War Wagon” or “The Magnificent Seven”. If you’re looking for a solid western with good performances, fine action sequences and a story that contains a little bit more thought to social issues than you might expect from the genre, VALDEZ IS COMING is my recommendation. I haven’t seen this movie in years. Your review has me wanting to take a second look. Thank you, good sir.